Michael Petroni, writer of The Book Thief, The Rite and The Chronicles of Narnia: The Voyage of the Dawn Treader, directs his second feature with Backtrack. 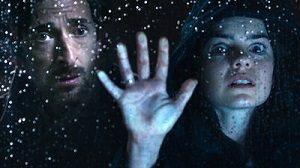 Filmed in Sydney, this little thriller was lucky enough to snare the likes of Adrien Brody and Sam Neill. Brody plays psychologist Peter Bower, who is still recovering from the death of his daughter a year ago. When he discovers a strange link between his patients, he’s forced to take a journey into his past to uncover a decades-old mystery. Brody gets mad props for his incredible Aussie accent. Once or twice I heard an American edge creeping into his pronunciation, but for the most part he does a fantastic job. He has a wonderfully melancholic and thoughtful visage – one that’s perfectly suited to a film of this nature. Because of when he hit the big time in The Pianist, he only got to do The Village and The Jacket before thrillers started to fall out of fashion in Hollywood. Seeing him once more in this genre is exciting to say the least. Neill is of course as reliably awesome as ever, whilst I desperately wanted to see more of Robin McLeavy’s character, Sergeant Henning. Part of my genuine love for this film has to do with the fact that we don’t see as many of its kind as we used to. Whilst we saw thrillers on our screens in the 90s and early 2000s, they’ve died out, leaving us with micro-budget indies or $200 million superhero movies. There’s something so enticing about the ever-so primal storytelling present in thrillers, and it’s something I miss. If this film had come out the same time as The Sixth Sense or The Others, I’m sure it would have passed me by. But here and now, it was just what I needed. The first act is actually quite dreamlike, such that I was put in mind of the underrated Stay. Backtrack is stylishly shot. The cinematography never gets too flashy, but we’re treated to some confident camera moves when it really counts. Such techniques make the jump scares work perfectly. It’s all accompanied by a great score courtesy of Dale Cornelius. The Blu-ray presentation looks beautiful, whilst there are some snippets of interviews also included in the special features. At the end of the day, you’ll probably have seen this kind of movie before, but it’s hard to go past a thriller like this – featuring the likes of Brody, Neill and McLeavy, no less – when such films are so thin on the ground. Backtrack is available now on DVD and Blu-ray from Madman. This entry was posted in Film Reviews and tagged Horror, Mystery, Thriller by Stuart Wilson. Bookmark the permalink.